Since 23rd July last year, our editorial team has used the first generation Apple iPad practically every day. Find out what we made of the tablet, what you can use it for, and if (and by how much) it is improved by iOS 4.2 (including Apple TV). In January 2010 Steve Jobs made a keynote speech which introduced the iPad as a revolutionary new device. It is meant to fill the gap between the iPhone and the MacBooks, and is designed purely with entertainment in mind. From a technical standpoint the iPad is, quite simply, an oversized iPhone without the capacity to make phone calls; but with it Apple somehow managed to trigger the tablet boom that we currently find ourselves in. In our comprehensive review of the Apple iPad we originally liked the tablet’s touchscreen interface, the excellent IPS display and the long battery life. 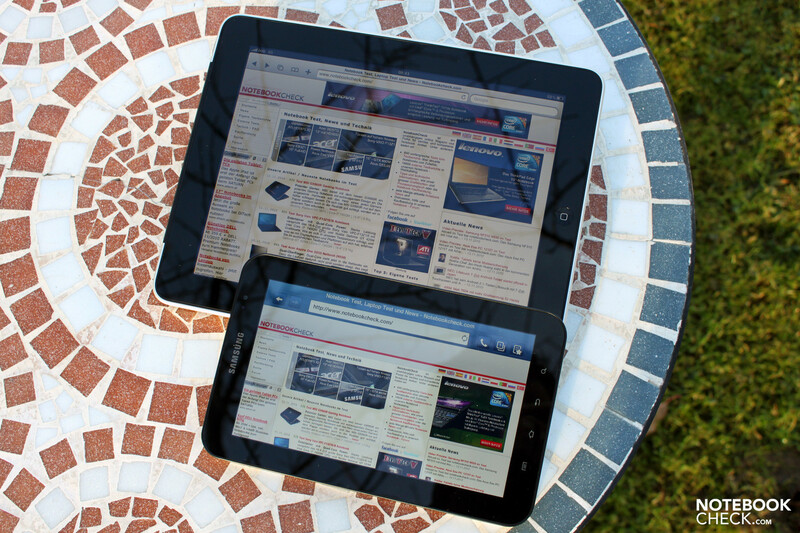 After spending almost six months with the iPad, and having carried out the update to iOS 4 and reviewed notable competitors such as the Galaxy Tab and the Dell Streak, we decided it was time to share our long-term impressions of the Apple iPad. We still like the iPad’s straightforward design very much at the end of this long testing period. However, we usually keep the iPad inside a protective case, which means that we don’t get to feel the high-quality aluminium surfaces. 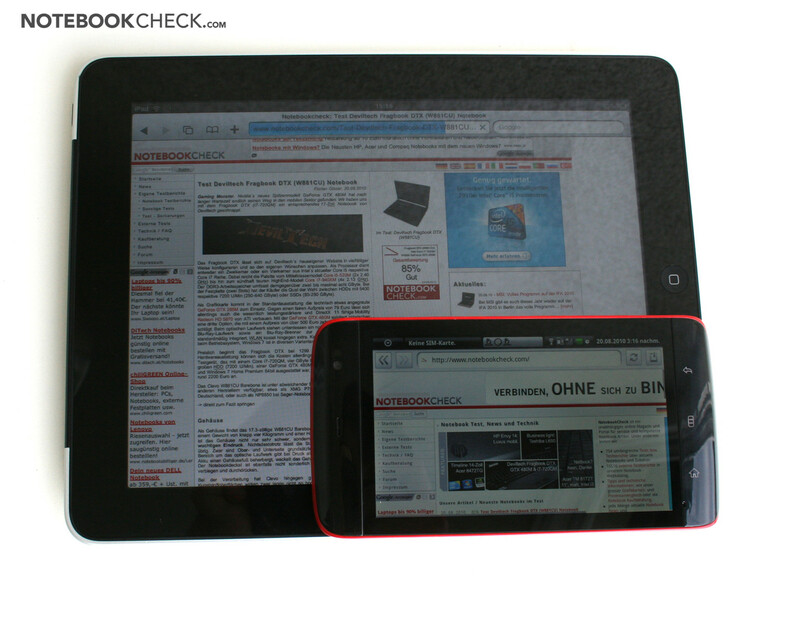 The 10-inch tablet gave us no cause for complaints in terms of workmanship throughout the whole of the test period. There were no creaking noises or excessive flexing while we used it, which is excellent. Above all we have enjoyed the size of the iPad. The 10” display gives you a lot of room to play with, particularly compared to the 7" Galaxy Tab or the 5" Dell Streak. Of course, this does reduce portability somewhat, but the rival products are not small enough for your back pocket either. The tablet is wonderfully easy to use in different places like on the sofa or in bed. Traditional notebooks generally require space on your lap. iPad versus Dell Streak 5"
iPad versus Samsung Galaxy Tab 7"
The iPad’s 10” IPS screen continues to stand out compared to any rivals that have appeared so far. We were pleased with the very good maximum brightness and the excellent viewing angles during everyday use. The layer of glass over the touchscreen is comfortable to use, but it does pick up strong reflections from bright surroundings. This is especially distracting when you use it outside. However, in many situations this problem is overcome by the strong brightness. The accurate multi-touch screen, coupled with a well-adapted operating system, handles convincingly. The only drawback is the on-screen keyboard, which is inherently less effective than a physical keyboard. Short emails can be dealt with easily enough, but it can be very fiddly getting the cursor to move to exactly the right spot. Virtual cursor keys would be a real step forward. 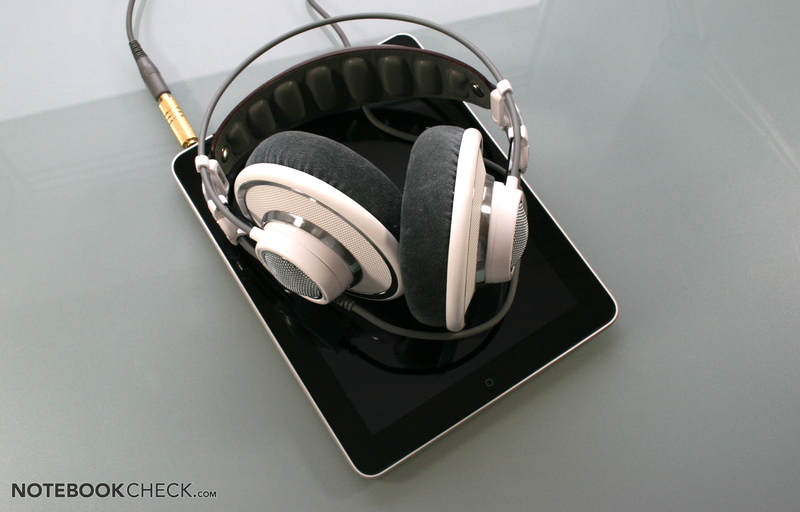 The iPad only produces sound from its single loudspeaker. Unfortunately it is easy to cover this accidentally with your hand. The sound quality is not amazing, because of the size of the iPad, but it is good enough for YouTube videos or films. Temperature gain was never an issue during the long-term test; the iPad never got uncomfortably hot. We also never saw it turn itself off due to overheating - although we were not using the iPad for hours on end in the sun. The sound quality via the headphone output port was very good using AKG GHS1 headphones. With a high-impedance headset like the AKG K701 Reference, the output is noticeably quieter, but still loud enough on the maximum settings (though giving little room for manoeuvre in a loud environment). 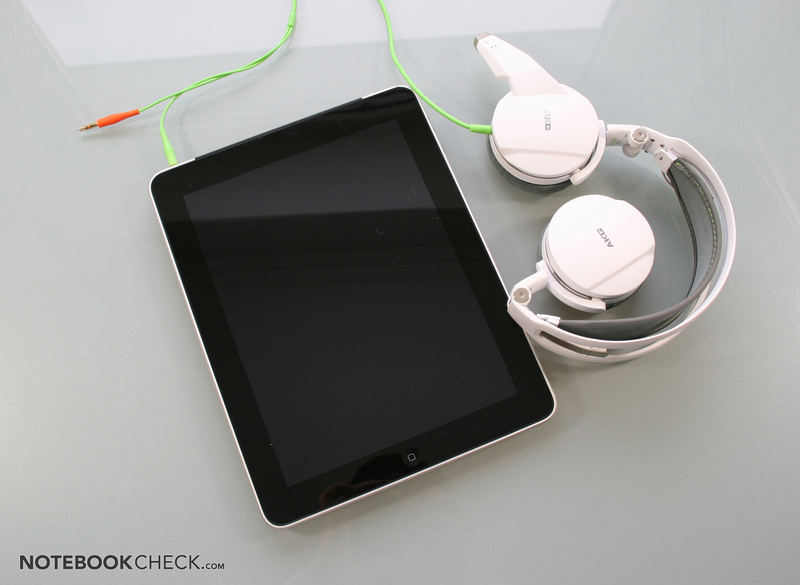 The iPad is totally and utterly geared towards one use - entertainment. Surfing the net is a lot of fun, with the iPad responding fluidly to your touch. 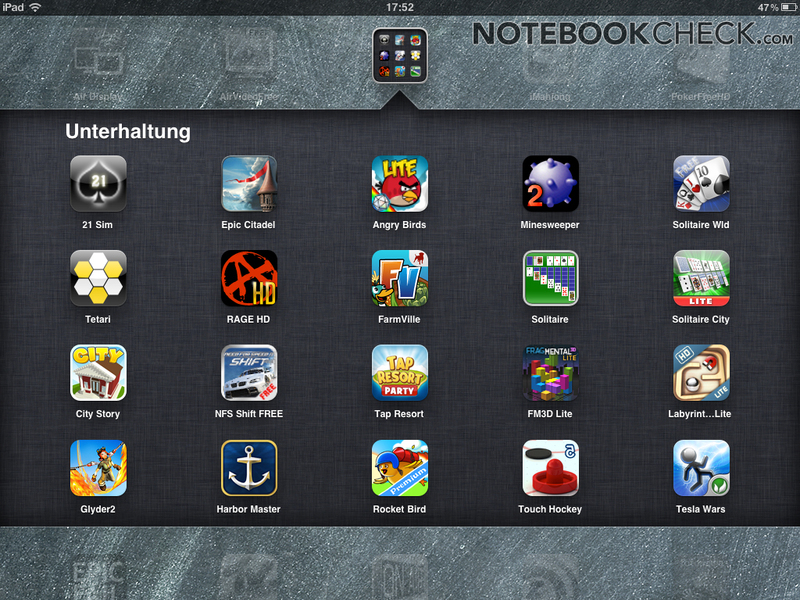 Daily newspaper and magazine apps (mostly overpriced) and small games are great for killing time. With the iPad having been on the market for a relatively short time, it is amusing mini-games like Cut the Rope which dominate the App Store. But the first heavyweight games are starting to arrive that really take advantage of the iPad’s hardware. Rage HD or Inifinty Blade have impressive graphics - although in terms of content you really notice the short development time. In the long-term we can expect good things from the iPad in terms of both visuals and content. Particularly compared to Android, the range seems to be of a substantially better quality. For more productive purposes, we mostly used an RSS reader, the email program and Air Display (using the iPad as the third monitor for our Mac). But when using many of the other business applications you quickly notice the limits of the operating system, originally designed for the phone. The mobile browsers themselves are not really suitable for generating content; for example, the mobile Safari browser (like the Android browser) does not support ‘content editable,’ and it is only very recently that it became possible to edit documents in Google Docs. It renders many text editors in content management systems unusable, and you have hope for special apps to solve the problem. We would recommend the 3G version of the iPad with integrated UMTS and GPS, like our review model. Mobile data transfer worked very well in our test (with a data card from 3 or Bob). Without internet, it becomes immediately and painfully clear that the iPad is optimized for working with a decent internet connection. Offline, many of its applications work in a severely limited fashion, leaving you with nothing but games (many of which are also web-based! 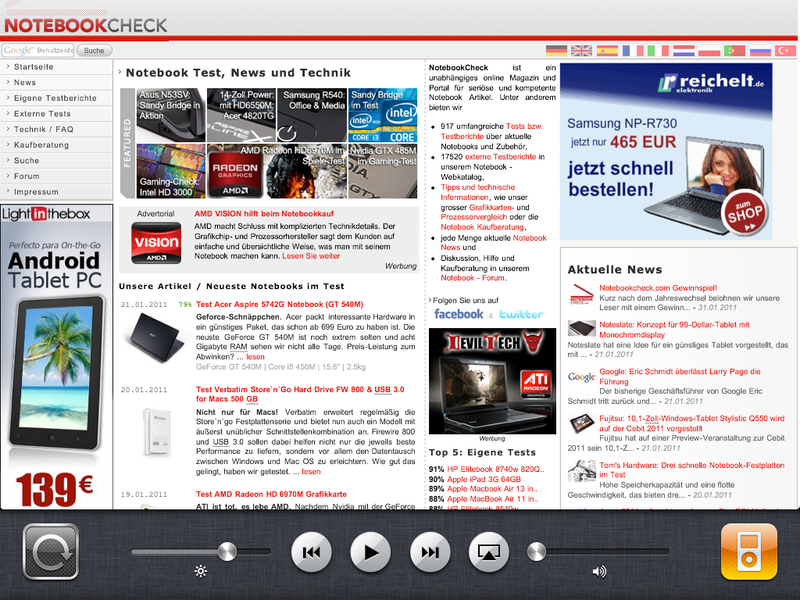 ), music and videos. The integrated GPS sensor also held its own during the test, although the compass is not very accurate indoors. One disadvantage compared to Android tablets and smartphones is the lack of Live Navigation through Google Maps. You can plan routes, but there are no directions or arrows, leaving you dependent on costly professional solutions from the App Store. 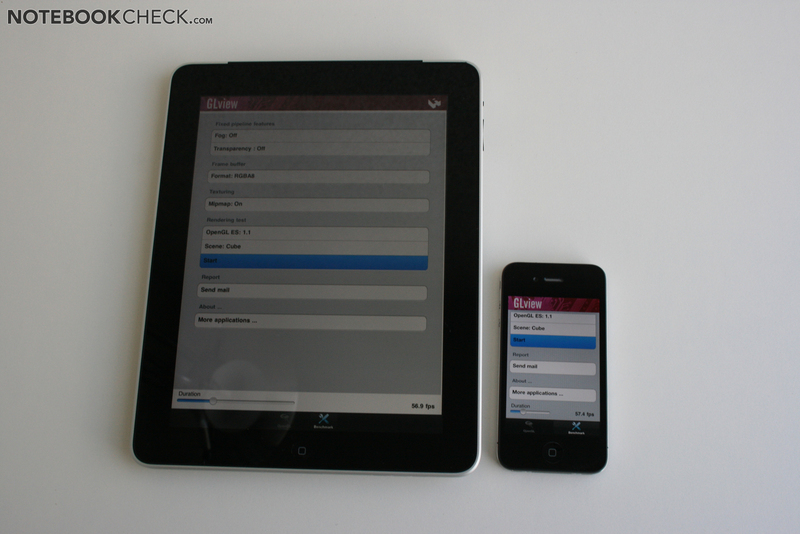 Since 22nd November 2010 iPad users have been able to update to the new iOS 4.2 free of charge. It introduces multitasking (in a limited form) and folders, both long-hoped for features. Apple has also come up with some new ideas to improve communication with other devices, in the form of AirPlay and AirPrint. 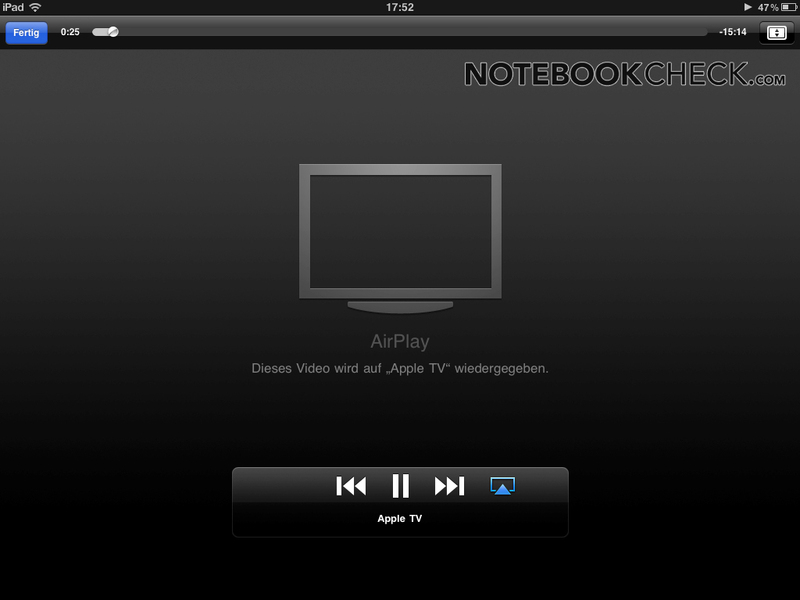 AirPlay is particularly impressive combined with the Apple TV box. With a single click you can stream photos, music and videos to a home cinema system. This worked perfectly when we tested it and is definitely recommended thanks to the reasonably priced Apple TV hardware. However, AirPrint was a little bumpy getting started and currently only works with a few HP printers - which is a shame. All in all, the new inclusions to 4.2 were not revolutionary, but they did considerably improve the iPad in several areas. 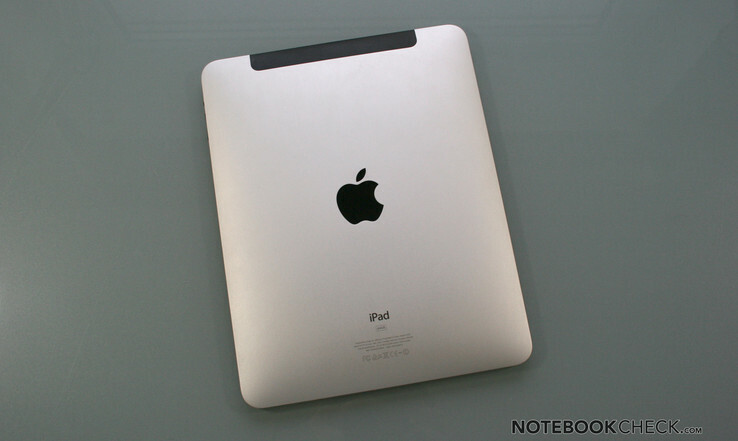 The single-core ARM processor (known as Apple A4) gives the iPad a high-performance feel. There are no jerky menus or long delays like on the equivalent Android machines. The small amount of RAM (256 MB), however, seems to have an effect when surfing the net. The mobile Safari browser very often has to load pages again from scratch when you switch between tabs. This happens a lot less on the iPhone 4 with its 512 MB of RAM. We can recommend the Atomic browser as an alternative, as it doesn’t have this problem with tabs. Despite being used on a daily basis, our iPad’s battery life only decreased a little over time. In the stress test our machine (still running iOS 3.2) managed a battery life of somewhat more than 5 hours, which is only 10% shorter than originally. This is an important factor as it is not possible for you to change the battery yourself. Also the iPad won’t run if the battery doesn’t have at least a few percent residual charge. This means that if you have a defective battery you apparently have no option but to exchange your iPad as it cannot be run on mains power alone. The iPad continued to wow us throughout the long-term test. No hidden flaws became apparent in the hardware, and we still like it just as described in our original review. 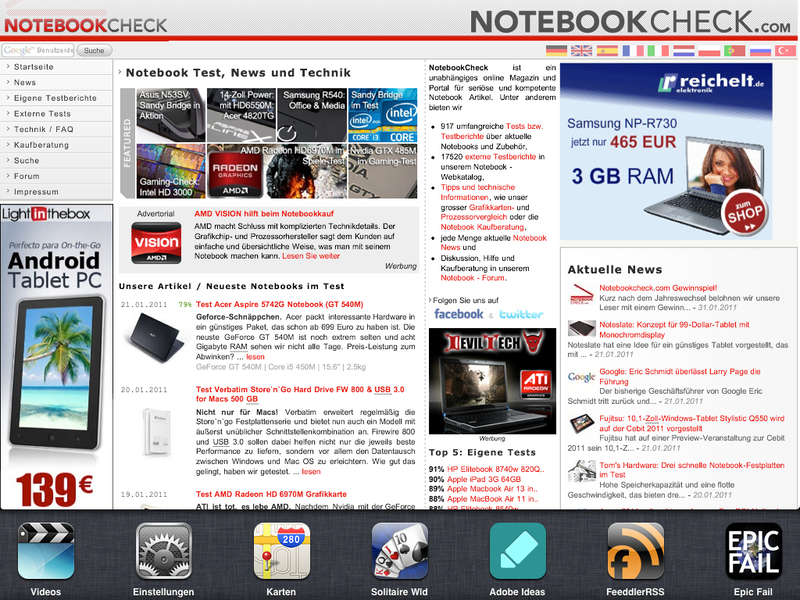 The new iOS 4 represents a significant improvement, thanks especially to the introduction of multitasking. It still has its closed system which is controlled by Apple. It means that interesting apps like the mobile Firefox browser or VLC are still denied to users. On the other hand, there is a wide range of genuinely high-quality applications in the App Store, with a simple payment system. Android has not (yet) achieved this. Despite all of this, the iPad is still predominantly a consumer tablet which has to be specially adapted if you want to use it for business. For this reason iOS still cannot compare with a desktop operating system. Once you have come to terms with its limitations, the iPad is still without a doubt far better than the rivals that came after it, like the Galaxy Tab and the Dell Streak.